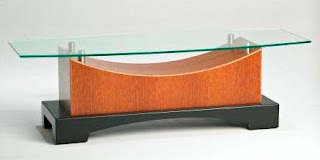 The Channel Cocktail Table is one of the first custom furniture pieces that Kevin designed and made, while he was still in school. Measuring 54" long x 21" wide x 16" overall height the main body of this table is crafted from a rare sampling of quartered English Oak veneer, which was sourced from my core stash of vintage woods. The tempered glass top was set on offsets of satin stainless steel which were meticulously inlaid into the concave curve of the pedestal top. This table was first displayed in juried "Studio North" exhibition at the 2010 Interior Design Show (IDS10). It was here that the table caught the eye of Gord Peteran, who teaches Furniture Design at the Ontario College of Art and Design (OCAD). Peteran said he "was struck by the simple understated grace of the table. While the table was basically composed of three simple forms made out of three different materials, there was a sophisticated relationship between them that is not common in contemporary design nor is it usually present in young makers work. Upon closer examination the quality of execution was beautiful." The Channel Cocktail Table will be on display at the upcoming "My Grain" exhibition at The Guild Shop in Toronto, which opens July 16th.